Oakie Acorn's run for Mascot Madness dominance came to an end as he fell to SUNY New Paltz's Hugo the Hawk in Round 2. 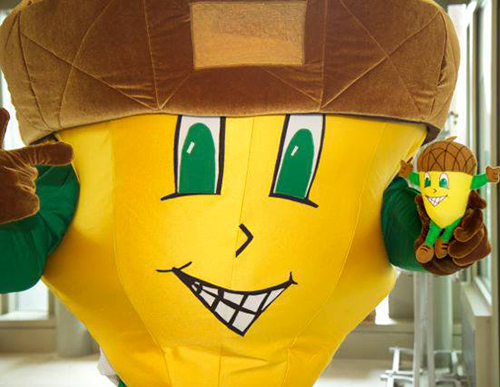 Oakie, the mascot for ESF's Mighty Oaks sports teams, was a 39th seed going into the competition. In Round 1, he defeated both SUNY Delhi and Erie Community College. He received 46 percent of the vote against Hugo, last year's champion. Mascot Madness is an online contest that pits SUNY mascots against each other in a standard single-elimination bracket of four divisions with five rounds. The competition is based on a series of questions posed to the mascots prior to the tournament including mascots' origin stories; thoughts on representing their teams; favorite events, New York travel destination and Broadway show; and what they like to do for fun. Oakie not only received support from the ESF community of students, faculty, staff and alumni, but also from a number of community organizations and Syracuse University.